What Day Of The Week Is November 8? 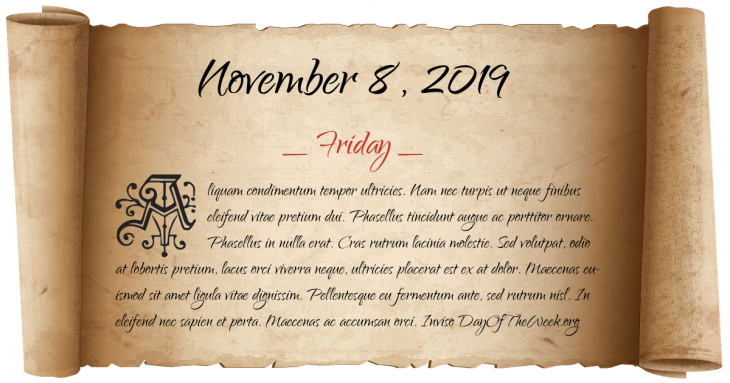 November 8, 2019 is the 312nd day of the year 2019 in the Gregorian calendar. There are 53 days remaining until the end of the year. The day of the week is Friday. Eighty Years’ War: Pacification of Ghent – The States-General of the Netherlands meet and unite to oppose Spanish occupation. Mary Lyon founds Mount Holyoke Female Seminary, which later becomes Mount Holyoke College. American Civil War: The “Trent Affair” – The USS San Jacinto stops the United Kingdom mail ship Trent and arrests two Confederate envoys, sparking a diplomatic crisis between the UK and US. The right ear of John Paul Getty III is delivered to a newspaper together with a ransom note, convincing his father to pay 2.9 million USD. Remembrance Day Bombing: A Provisional IRA bomb explodes in Enniskillen, Northern Ireland during a ceremony honouring those who had died in wars involving British forces. Twelve people are killed and sixty-three wounded. Who were born on November 8?